At first glance, this small object appears to be a fairly simple silver teapot. On closer inspection, however, this little teapot reveals its place in a craft history that spans over a thousand years: lusterware pottery. This teapot is not shaped from sterling silver as it appears, but is instead a molded ceramic vessel that has been coated with a “lustre” glaze made from metal oxides to create a shiny silver finish. The object was created in Staffordshire, England by the pottery company, Fieldings Crown Devon, in the early 20th century although the tradition of lustre glazing dates back much further. The earliest known examples of lustre appear on ancient Egyptian glassware. The invention of lustre decoration offered an inexpensive alternative to gilded ornamentation . While these early glass pieces date back to the third and fourth centuries, lustre fired earthenware did not make an appearance until the eleventh century in Egypt . Early Egyptian lustreware was very opulent, with a range of colors and motifs including animals and scenes of daily life including fishing in the Nile and working in the fields . The popularity of lustreware ceramics in Mesopotamia in the 13th century caused many to believe that the technique of lustre firing ceramics originated in Persia. Many of the pieces that survive today have designs and inscriptions that suggest Persian makers, even those objects that were discovered in Egypt . Despite the presence of these apparently Persian ceramics, a traveler’s diary from the 11th century led ceramic scholars to the conclusion that the home of the ornate glazing technique was, in fact, Cairo. Nâsir-i-Khusrau was a well-known Persian traveler and writer visited Old Cairo (then known as Fustât) in 1047 A.D and described his first experience seeing lustre decoration on ceramics. He compared the appearance ornate decoration to a type of Egyptian silk fabric called bukalimun, or “chameleon fabric” which is called that because it “changes every hour of the day” . The fact that a well-traveled Persian writer had never seen lustreware suggests that this technique was not yet practiced by Persian artisans. This account, combined with the presence of a ceramics school in Cairo led scholars to believe that Persian students later traveled the school in Cairo to learn the trade . From Egypt and Persia, lustreware moved to Spain where it was adopted by the Moors, and Italy, where the technique was further developed by sixteenth century artisan, Maestro Giorgio Andreoli at Gubbio . Giorgio mastered a technique called maiolica, also known as tin-glazed pottery, where he used an extra layer of glaze in order to enrich the colors of a detailed painted scene with red or gold metallic lustre . All of the potters that had utilized the technique up to this point had used it for ornamentation and not to glaze an object in its entirety. This changed somewhat when lustreware became popular in England during the late 18th century. While the tradition of using lustre techniques to embellish and combine multiple colors and patterns still existed, the British artisans also used it to create faux-silver pieces. Ceramic artisans began using traditional silversmith molds to create objects, specifically teapots and sugar bowls that could be lustre-fired completely to look like silver . The teapot in the Nichols House Museum’s collection falls into that category, having been designed to look like a Georgian period silver teapot. Campbell, Gordon. “Lustre.” Grove Art Online. Oxford Art Online. Oxford University Press. Web. 4 Mar. 2016. Martin, F. R. “The Origin of Lustre Ware.” The Burlington Magazine for Connoisseurs 53.305 (1928): 91-92. JSTOR. Web. 04 Mar. 2016. Butler, A. J. “The Origin of Lustre Ware.” The Burlington Magazine for Connoisseurs 16.79 (1909): n. pag. JSTOR. Web. 04 Mar. 2016. Martin, F. R. “Lustred Pottery in Egypt.” The Burlington Magazine for Connoisseurs 17.85 (1910): n. pag. JSTOR. Web. 04 Mar. 2016. Butler, A. J. “Egypt and the Ceramic Art of the Nearer East.” The Burlington Magazine for Connoisseurs 11.52 (1907): 221-26. JSTOR. Web. 04 Mar. 2016. Butler, A. J. “The Origin of Lustre Ware. ”The Buckingham Collection of Old English Lustre.” Bulletin of the Art Institute of Chicago (1907-1951) 16.1 (1922): 2-5. JSTOR. Web. 04 Mar. 2016. ”National Gallery of Art.” Andreoli of Gubbio, Giorgio, Maestro. N.p., n.d. Web. 04 Mar. 2016. This clock was made by Elnathan Taber (1768-1854), a clockmaker based in Roxbury, Massachusetts who was said to be the best apprentice in the shop to renowned clockmaker Simon Willard (1753-1848). [vi] These two men lived and breathed clocks. Although many artisans made pieces for clocks including mechanics, artists, forgers, and cabinetmakers, it was the clockmaker who had the knowledge to coordinate the ordering and assemble the pieces. For example, Elnathan probably ordered clock cases from a local cabinet maker, while the gears came from a factory in Birmingham, England. Elnathan apprenticed under Simon Willard after Simon made a name for himself in the Boston area for his fine clocks. [vii] Simon made household clocks and also installed large clocks in public buildings, including Old South Meeting House and the US Senate. Elnathan worked with Simon for years and later bought the business and, in a marketing strategy, also acquired the right to label his clocks “Simon Willard.” Simon was well known for producing quality clocks, so his name carried the public’s trust in its quality. The clock in the museum collection, however, bears Elnathan’s name but dates from a period when he would have been working alongside Simon at his shop. The clock features a patriotic eagle over the hood, and an allegorical image painted in the lunette, the arched top part of the dial. Tall clocks were investments in the eighteenth century, a sign of the growing social importance of accurate time-keeping. 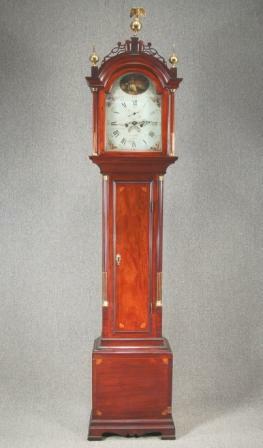 [i] Grandfather clocks were known as long case or tall case clocks before an 1876 song “Grandfather’s Clock” by Henry Clay Work popularized the new term http://www.songwritershalloffame.org/index.php/exhibits/bio/C198. Listen here: https://archive.org/details/MyGrandfathersClock. [ii] Philip Zea, “Timekeeping: The Lifestyle of Accuracy- An Interpretive Essay for the J. Cheney Wells Collection of New England Clocks at Old Sturbridge Village.” 1986. [vi] Walter A. Dyer, “The Willards and Their Clocks.” Country Life in America, June 1915, pg 47. [vii] For more information about the Willard family of clockmakers, see: Joseph Downs, “Three American Clocks,” The Metropolitan Museum of Art Bulletin. Vol. 32, No. 5, May 1937. 129-137; The Willard House and Clock Museum at http://www.willardhouse.org/.